I have a valid license, and i have installed it properly (according to the Xafari License Manager). When i rebuild the featurecenter application, it still gives this message. What can i do to be able to run the featurecenter application from the debugger? 1) If you want run featurecenter application using a Visual Studio, please use next application: C:\Users\Public\Documents\Xafari Framework v16.2.3010 Demos\FeatureCenter\CS. This applications have to run without message about licence. 2) Please check version the FeatureCenter, if you have applied licence for Xafari x10 the license is valid for Xafari products x10 only. 3) And you can send us request to license for the message and we try to help you. I used the application from the folder you mentioned. I'm still using 16.1.8 and that's also in sync with the Xafari version. According to Xafari License Manager, my license is 16.1.8010. I deleted all bin\ and obj\ folders and rebuilt the application. Same thing. Here is the log file. No mention of the license check, but as you can see, the application logs off immediately. 20.01.17 17:14:18.636	The ValueManagerType is initialized by the default value: SimpleValueManager. 20.01.17 17:14:30.944	XF Assembly is compiled successfully. 20.01.17 17:14:30.944	XF Assembly 'C:\Users\Willem\AppData\Local\Temp\Xafari\FeatureCenter\paaox5wd.ign\XFAssembly.dll_hvva3slw.zln.dll' is loaded successfully. 20.01.17 17:14:44.953	Initialize service 'Xafari.BC.Settings.Runtime.SettingsAccessorDesigner+GeneratedSettingsAccessor' is complete. 20.01.17 17:15:47.526	Service 'Xafari.BC.Services.ServiceSpacesManager' is activated: True. 20.01.17 17:15:47.528	Service 'Xafari.BC.DynamicProperties.DynamicPropertiesHelper' is activated: True. 20.01.17 17:15:47.529	Initialize service 'Xafari.BC.DynamicProperties.DynamicPropertiesHelper' is complete. 20.01.17 17:15:47.550	Service 'Xafari.BC.Settings.Runtime.SettingsAccessorDesigner+GeneratedSettingsAccessor' is activated: True. 20.01.17 17:15:57.231	Service 'Xafari.BC.Services.ServiceSpacesManager' is deactivated: False(Is initialized=True, Is setup completed=True, Is Application setup completed=True, Is logged on=False). 20.01.17 17:15:57.237	Reset service 'Xafari.BC.Services.ServiceSpacesManager' is complete. 20.01.17 17:15:57.237	Service 'Xafari.BC.DynamicProperties.DynamicPropertiesHelper' is deactivated: False(Is initialized=True, Is setup completed=True, Is Application setup completed=True, Is logged on=False). 20.01.17 17:15:57.241	Reset service 'Xafari.BC.DynamicProperties.DynamicPropertiesHelper' is complete. 20.01.17 17:15:57.243	Service 'Xafari.BC.Settings.Runtime.SettingsAccessorDesigner+GeneratedSettingsAccessor' is deactivated: False(Is initialized=True, Is setup completed=True, Is Application setup completed=True, Is logged on=False). 20.01.17 17:15:57.246	Reset service 'Xafari.BC.Settings.Runtime.SettingsAccessorDesigner+GeneratedSettingsAccessor' is complete. Is the message about the license if you run the application? Please, close your VS, delete this folder: 231A4CCF-8803-4417-BF07-051DAA1E4DC2 from HKEY_CLASSES_ROOT\Licenses, run a Xafari License Manager and send a new request to activate license. That was my idea also. I sent a request three hours ago but did not receive an answer. This request had been sent when you previous license for Xafari x10 was activated yet. New license alone did not work (thank you Aleksandra for sending a new one). 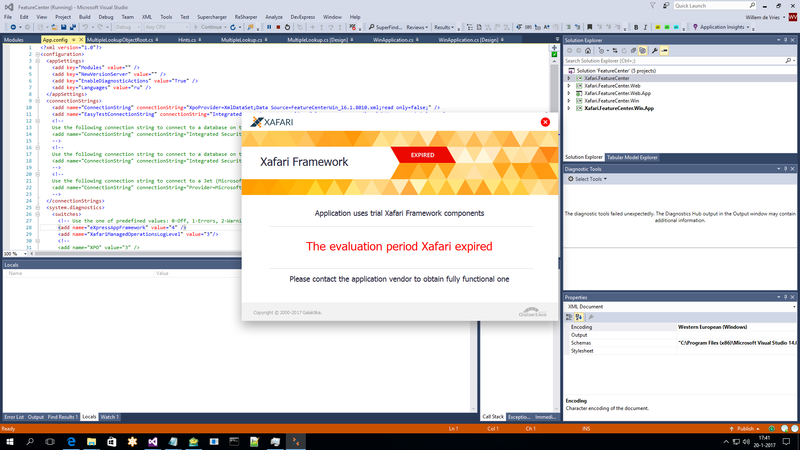 After uninstalling and reinstalling Xafari, the FeatureCenter starts from VS.
Do you have message about invalid license when you work with Xafari applications? Hi Sasha, no i never had a message about an invalid license. Only with the FeatureCenter application. But not anymore since i reinstalled Xafari. If you need any further assistance let us know about it. May I close this ticket? The ticket can be closed (i will do so).